The demand for health care professionals—specifically nurses—is growing at a fast pace. So as a nursing student, you're in a prime position to land top nurse jobs. To do that, resume expert Kim Isaacs says it helps to have a comprehensive resume. 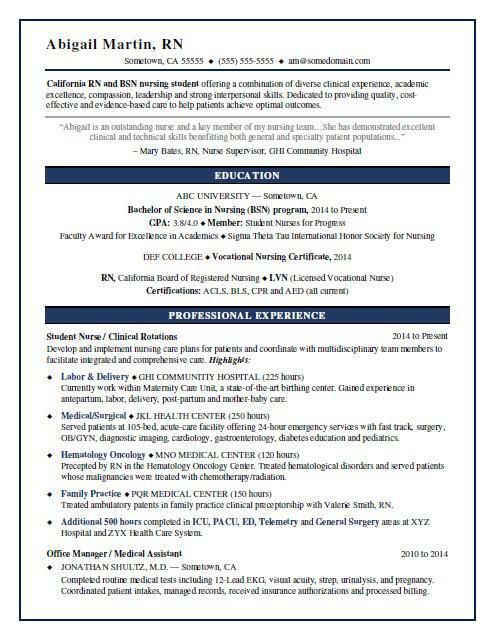 For writing tips, view this sample resume for a nursing student that Isaacs created below, or download the nursing student resume template in Word. Jobs for nurses are projected to grow by 15% (or 438,100 jobs) from 2016 through 2026, which is much faster than average, according to the Bureau of Labor Statistics (BLS). You'll find the highest level of employment for this job in the following states: California, Texas, New York, Florida, and Pennsylvania; and in the following metropolitan areas: New York City, Los Angeles, Chicago, Houston, and Boston. As a nurse, you can expect to earn a median wage of $70,000 per year, or $33.65 per hour, according to the BLS. Additionally, you can search for nursing student jobs on Monster. California RN and BSN nursing student offering a combination of diverse clinical experience, academic excellence, compassion, leadership and strong interpersonal skills. Dedicated to providing quality, cost-effective and evidence-based care to help patients achieve optimal outcomes. Develop and implement nursing care plans for patients and coordinate with multidisciplinary team members to facilitate integrated and comprehensive care. Currently work within Maternity Care Unit, a state-of-the-art birthing center. Gained experience in antepartum, labor, delivery, post-partum and mother-baby care. Served patients at 105-bed, acute-care facility offering 24-hour emergency services with fast track, surgery, OB/GYN, diagnostic imaging, cardiology, gastroenterology, diabetes education and pediatrics. Precepted by RN in the Hematology Oncology Center. Treated hematological disorders and served patients whose malignancies were treated with chemotherapy/radiation. Treated ambulatory patents in family practice clinical preceptorship with Valerie Smith, RN. Additional 500 hours completed in ICU, PACU, ED, Telemetry and General Surgery areas at XYZ Hospital and ZYX Health Care System. Completed routine medical tests including 12-Lead EKG, visual acuity, strep, urinalysis, and pregnancy. Coordinated patient intakes, managed records, received insurance authorizations and processed billing. How healthy is your resume? A strong resume is key to getting an employer's attention, so take the time to get the details right. Could you use some help with that? Get a free resume evaluation today from the experts at Monster's Resume Writing Service. You'll get detailed feedback in two business days, including a review of your resume's appearance and content, and a prediction of a recruiter's first impression. Think of it as part of your continuing education.